The tax administrators of the states of Alabama, Arkansas, Florida, Georgia, Kentucky, Louisiana, Mississippi, North Carolina, South Carolina, Tennessee, Virginia, and West Virginia recognized that, by reason of their geographical proximity to each other have the same interest in matters of tax administration. Accordingly, these tax administrators believe that it will be to the advantage of their respective state for them to form the Association for the purposes and the manner hereinafter set forth. Section 1. NAME. 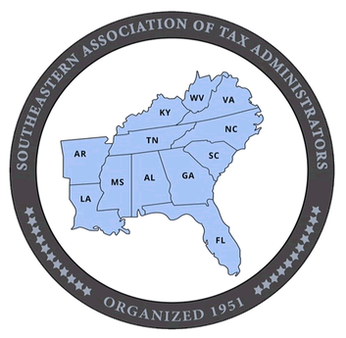 This Association shall be known as the Southeastern Association of Tax Administrators, and its membership will be determined under these bylaws as set forth in Article II. Section 2. ENUMERATION. The purpose of this Association shall be to promote cooperation among the Southeastern States in taxation and tax related matters through meetings and other communicative means; to afford an opportunity to the members to exchange ideas on problems of tax administration; to assemble information pertaining to the various types of tax laws as well as administrative methods; to disseminate such information as may be of benefit to the members in order to develop a coordinated activity; to strive for equalization of the tax burden; and for simplicity and uniformity in administration. Section 1. INDIVIDUAL MEMBERSHIP. Full membership in the Association will be confined to tax administrators, budget officials, or public finance officers representing the states herein set forth, including their legal counsel and respective departments engaged in the administration or collection of tax revenue. Section 2. STATE MEMBERSHIP. The states whose officials are entitled to full membership in this Association are as follows: Alabama, Arkansas, Florida, Georgia, Kentucky, Louisiana, Mississippi, North Carolina, South Carolina, Tennessee, Virginia, and West Virginia. Section 3. ASSOCIATE MEMBERSHIP. Members of the Industry Council of the Southeastern Association of Tax Administrators shall be recognized as associate members of the Association. Associate members shall be non-voting members who support the stated purposes of the Association and provide assistance and counsel as needed. Section 1. OFFICERS. The officers of the Association will consist of a President, a First Vice- President, a Second Vice-President, and an Executive Director. Section 2. ANNUAL ELECTIONS. The President, First Vice-President and Second Vice-President will be elected annually by a majority vote of the Executive Committee of the Association. They will hold office until their successors have been elected. the Executive Committee of the Association and will serve until replaced by a majority vote of the Executive Committee of the Association. Section 4. EXECUTIVE COMMITTEE. There shall be an Executive Committee which will consist of the officers of the Association and a member appointed by each member state. Section 5. VACANCIES. A vacancy of any officer or committee member of the Executive Committee may be filled by a majority vote of the Executive Committee for the unexpired term, except that a vacancy for an Executive Committee member who is not an officer shall be appointed by the state agency the position represents. The Second Vice-President will ascend to the position of First Vice-President, and the First VicePresident will ascend to the position of President. Section 1. THE EXECUTIVE COMMITTEE will manage the affairs of the Association. Meetings of the Executive Committee shall be held at the annual meeting of the Association and at such times as the President or a majority of the committee may determine upon 72 hours written notice to all members. At such meetings a majority of the committee will constitute a quorum. Executive Committee members who are unable to attend a meeting may send a voting designee. No more than one vote per member state will be recognized for each motion or action voted upon by the Executive Committee. In order to perpetuate the Association, the President shall appoint a committee on nominations at each annual meeting to make nominations for the officers of the Association. Further, the Executive Committee shall establish any temporary committee it feels is necessary to properly carry on the business of the Association and will appoint members to such committees as deemed necessary. The Executive Committee may establish a procedure to adopt resolutions upon an affirmative vote of the majority of the Executive Committee. The Executive Committee shall adopt an annual budget and provide guidelines for the raising of revenue to fund the budget. The Executive Committee may provide for reasonable compensation for the services rendered by the Executive Director. The Executive Committee may conduct business as may be necessary by a poll of the members of the committee by telephone, mail, or electronic communications. Section 2. THE PRESIDENT will be the chief executive officer of the Association and chairperson of the Executive Committee. The duties will be prescribed by the Executive Committee. In the President’s absence the First Vice-President will preside, and in the absence of the First VicePresident, the Second Vice-President will preside. Section 3. THE FIRST VICE-PRESIDENT will assist the President and assume the functions of the President whenever the latter are absent or unable to act. The First Vice-President shall be responsible for oversight of the preparation of the annual budget and an annual audit of the financial records of the Association, and for such other duties that may be assigned by the Executive Committee. The annual budget for the operation of the Association shall be submitted for approval by the Executive Committee. Section 4. THE SECOND VICE-PRESIDENT will assist the President and assume the functions of the President whenever the President and First Vice-President are absent or unable to act. Additional duties may be prescribed by the Executive Committee. Section 5. THE EXECUTIVE DIRECTOR will have the following duties and responsibilities: manage the care and custody of all finances of the organization, including the preparation and administration of the annual association budget, and any subordinate conference/workshop budgets; conduct all banking transactions, maintain accurate and timely financial records, and prepares financial reports for the Executive Committee, keep a complete roll of the membership and keep a record of the proceedings of all meetings of the association and any other matters of which a record shall be required; serve as liaison between the Executive Committee and any standing or ad hoc committees; maintain SEATA website; coordinate SEATA annual conference with the host state; coordinate SEATA workshops with the host state; participate in and coordinate necessary logistical support for all SEATA meetings, including meetings of the Executive Committee and the Industry Council; maintain SEATA database(s), including conference database, conference registration system with any upgrades such as online registration, dues database, and other records of the association; conduct registration for conferences and workshops in conjunction with the host state; promote associate membership to SEATA industry partners; serve as liaison between the Executive Committee and the SEATA Industry Council and its individual members; obtain sponsorship funds for the organization, the annual conference, and the workshops; serve as liaison between the Executive Committee/host state and SEATA conference vendors and sponsors; attend SEATA sponsored workshops, conferences and Executive Committee meetings; serve a liaison, as needed, between SEATA and the Federation of Tax Administrators and the other regional associations; and perform other duties as assigned by the Executive Committee. Qualifications for the position of Executive Director shall be set by the Executive Committee. Section 6. Ex-officio membership shall consist of those individuals who are past presidents of the association and who are still serving in their official capacity with their respective agencies. Exofficio members will assist the Executive Committee in an advisory capacity on matters as requested by the committee. Section 1. The Information Exchange Committee shall be created for the purpose of promoting cooperation among the Southeastern States in taxation and tax related matters through the administration of the SEATA Information Exchange Agreement. Through meetings and other communicative means, the committee will provide an opportunity for the timely exchange of ideas, tax information, and compliance issues among the member states. These efforts will encourage voluntary compliance and provide taxpayer education opportunities. Section 2. Members of the Committee will be appointed from each state within SEATA and no more than one vote per member state will be recognized for each motion or action voted upon by the Information Exchange Committee. Meetings of the Information Exchange Committee shall be held at the annual meeting of the Association and at such times as the chairman or a majority of the committee may determine upon 72 hours written notice to all members. A written report of the activities of the Information Exchange Committee shall be submitted annually to the Executive Committee. Section 3. The Information Exchange Committee may form subcommittees as deemed necessary to promote cooperation among the Southeastern states. The activities of subcommittees will be included in the written report as required in Section 2 of this Article. Section 1. The Individual Income Tax and Processing Committee shall be created for the purpose of promoting cooperation among the Southeastern States in individual income taxation and tax related matters, including the processing of tax returns and remittances. Through meetings and other communicative means, the committee will provide an opportunity for the timely exchange of ideas concerning the administration and processing of individual income taxes among the member states. These efforts will encourage voluntary compliance, enhance states’ customer service to taxpayers, and promote efficiencies in the member states’ handling of individual income tax collection. Section 2. Members of the committee will be appointed from each state within SEATA and no more than one vote per member state will be recognized for each motion or action voted upon by the Individual Income Tax and Processing Committee. Meetings of the Individual Income Tax and Processing Committee shall be held at the annual meeting of the Association and at such times as the chairman or a majority of the committee may determine upon 72 hours written notice to all members. A written report of the activities of the Individual Income Tax and Processing Committee shall be submitted annually to the Executive Committee. Section 3. The Individual Income Tax and Processing Committee may form subcommittees as deemed necessary to promote cooperation among the Southeastern states. The activities of subcommittees will be included in the written report as required in Section 2 of this Article. Section 1. ANNUAL DUES. Each member state and associate member of this Association shall pay annual dues each fiscal year of a sum to be fixed by the Executive Committee of the Association in order to assist in the funding of Association aims. Section 2. ENTITY CLASSIFICATION AND TAX FILINGS. The Association will apply for nonprofit corporation status under Section 501c(6) of the Internal Revenue Service. The officers of the Association will be the officers of the corporation. The Executive Director will file all tax forms required of the organization. Section 3. SOLICITATION AND ACCEPTANCE OF GIFTS. Member states and employees of these states are prohibited from solicitation or acceptance of gifts of cash or merchandise from nongovernmental entities on behalf of the Association. Any non-governmental entity wishing to donate any gift to the Association shall do so through the Industry Council of the Association. Direct sponsorship of official annual meeting and workshop events by any non-governmental entity shall not be permitted. registration fee will be required to attend the annual meetings. The amount of the registration fee shall be set by the Executive Committee. Section 2. ANNUAL MEETING RESOLUTIONS. Resolutions may be adopted at such annual meetings upon a majority vote of the Executive Committee provided the resolution has been discussed at the annual meeting, or has been discussed at some prior annual meetings. Section 3. EXECUTIVE COMMITTEE MEETINGS. Special meetings of the Executive Committee may be held at any time or place when called by a majority of the Executive Committee upon 72 hours written notice to all committee members. Section 4. SECTION MEETINGS AND WORKSHOPS. Sectional meetings and workshops for the study and discussion of any particular subject of taxation or any administrative problems related thereto may be held at the annual meeting at any time or place when approved by the Executive Committee. These bylaws may be amended by a two-thirds vote of the Executive Committee at the annual meeting of the Association, or a special meeting called for such purposes.